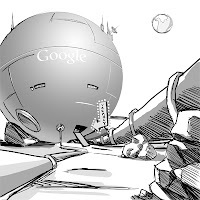 One, apparently Google is setting up a location on the Moon. Second, the confluence of digital media and the mobile device seems to be reaching a white-hot level of growth. I've been a happy owner of of broadband enabled PocketPC for quite some time now, but with, the rollout of the iPhone and other consumer focused broadband phones, I think the platform is there for both paid and advertising-driven content companies to drive an extraordinary amount of revenue. I'll be spending some time this Friday at the Digital Media Conference in lovely Silver Spring, MD. I'm looking forward to hearing from the experts how this exploding market is going to evolve, who the winners will be and when will I be able to just implant an iPhone in my brain and let Steve Jobs control me remotely.